October is the "International Cybersecurity Campaign." In order to deepen awareness of the importance of cybersecurity to all people using the Internet, we promote cybersecurity awareness raising activities in cooperation with ASEAN member states. The Internet has producted significant value by connecting people, things and services globally. At the sametime, however, cyber threats have been easily crossing national borders. In order to protect ourselves from the cyber threats and keep the Internet safe to use, it is necessary for everyone using the Internet to pursue cybersecurity. And this is a common challenges not only Japan, but also worldwide. 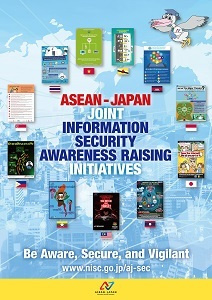 Therefore, in addition to the "Cybersecurity Month" held in every February, since 2012, the Government of Japan has been promoting cybersecurity awareness raising activities in cooperation with ASEAN member states as the "International cybersecurity Campaign" in every October. 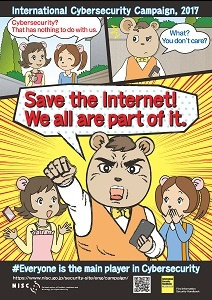 A message emphasizing the importance of information security was released. 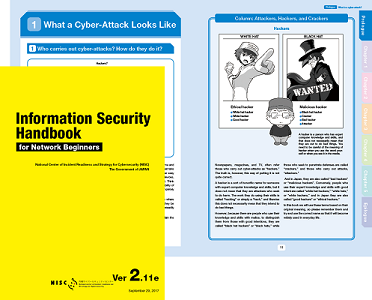 NISC has created a handbook as part of the awareness raising activities for cybersecurity. (C) 2015 National center of Incident readiness and Strategy for Cybersecurity.